Whether you own a retail shop, restaurant, hotel chain or large office complex, in Manhattan. New York.Glass Protector window films provide business owners and facility managers with an economical way to improve their bottom line. Not only does window film enhance building appearance and improve occupant comfort, it dramatically increases energy efficiency, reducing operating expenses year after year. By rejecting up to 82 percent of the suns total solar energy, Glass Protector window films for commercial applications help reduce energy bills and chiller run time. Additionally, comfort levels will be significantly improved with the reduction of uncomfortable hot spots and annoying glare. Youll see an immediate return on your investment, plus, your employees and customers will thank you. The suns ultraviolet is a major contributor to the fading of draperies, carpets and storefront display items. Thats why you need Glass Protector window films. They reject almost 100 percent of the suns harmful and damaging ultraviolet light, helping to prolong the life of your furnishings and valuables. Standard 2 mil Glass Protector films provide an increased measure of shatter resistance to windows and glass doors because the film and its special mounting adhesive helps hold glass fragments in place. However, if safety and security are paramount concerns, Armorcoat®, a series of tough, shatter resistant window films available in 4 to 14 mil thicknesses. Regardless of architectural design, Glass Protector window films installed on commercial buildings are the most cost-effective way to rejuvenate a propertys exterior appearance. A variety of shades, colors and performance levels are available and can easily be coordinated with a propertys interior or exterior for a more contemporary look. 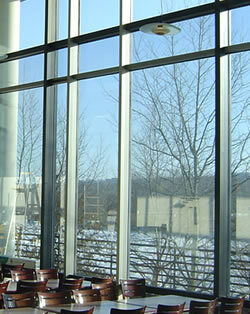 All Glass Protector and Armorgard brand window films are made with only the best raw materials and the most advanced manufacturing techniques. All Glass Protector films are made with a special scratch resistant coating called Durogard®, which is designed to keep the film looking new for years to come. You don't have to guess how much you'll be saving when you have Glass Protector window film installed. Demand Analyzer is software based on the U.S. Department of Energy's DOE-2 building energy simulation program. With this highly sophisticated application, our trained professionals and independent dealers can assess your facility and provide you with a written report displaying estimated energy savings and ROI pay back period. Occupants are more comfortable after the installation of 30,00 square feet. 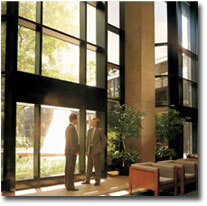 The U.S. Department of Energy in Washington, D.C. had over 80,000 square feet of 8 Mil solar safety window film installed. This improves the energy efficiency while adding a new safety measure to the building. 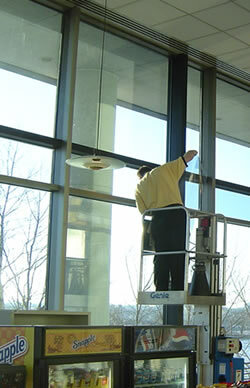 Window tinting installation is professionally installed with minimal disturbance to business or office routine.